Rafa Benitez believes the character of his Newcastle United side is unbeatable. The team came from behind to draw 2-2 with Bournemouth on Saturday thanks to a stunning injury-time goal from Matt Ritchie. 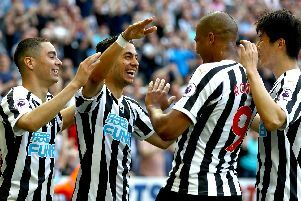 Newcastle’s comeback at the Vitality Stadium followed a fightback against Everton at St James’s Park a week earlier. Asked what the late goals said about his team, Benitez said: “It means that the players don’t give up and they continue working hard, and they try to do the things that we have tried for the other 89 minutes, and continue doing them into the last minute. Benitez was unhappy with the performance of referee Mike Dean, who awarded Bournemouth a second-half penalty after Federico Fernandez challenged Nathan Ake for a corner. “I think we were quite solid and well organised against a good team – a good team in attack,” said United’s manager. “But, at the same time, we knew that we could damage them, and then we would try to manage these things in attack and in defence. “It was not easy sometimes, because we have changed a few players, and the other team are good between the lines and they have some pace, but, overall ,the fact we were winning 1-0 was good. “OK, so we had some situations where you can do something, but they could do something too. “You go in at half-time 1-0 up, and then you have to go and manage the game, and they have to come, so you will have more space in which to play counter-attack. “But then you have a decision which changed everything. “Then you have to carry on again, keep pushing again, and also with the belief because some of the players knew it was not a penalty.